Unity Marketing Corporation was started and incorporated by Mr. Julian Camacho and Mrs. Herminia Tan-Camacho on May 12, 1978. They started Unity with 2 other employees; both of whom are still with the company. 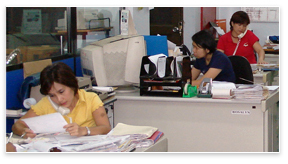 When they started, they had minimal product inventory + a small circle of clients mostly based in Metro Manila only. Over the next few years, their clientele grew slowly. Unity became known within the air-conditioning and refrigeration as a wholesaler/distributor of QUALITY air-conditioning and refrigeration products. During the early years; Mr. and Mrs. Camacho had to look for foreign suppliers; mainly from US and Europe; to bring in and introduce to the local industry. After a few years; foreign companies started contacting Unity Marketing Corporation to be the exclusive distributor of their air-conditioning and refrigeration products. Unity in the 1990's started to diversify into equipments related to air-conditioning and refrigeration industry as well. The company started to import Pangkat polyurethane insulated panels from Pangkat in Penang, Malaysia. They were also given the distributorship for Icetronic ice machine from Italy. They also got imported refrigeration equipments like chillers, freezers, and pastry showcases from Baili in Guangdong, China. In 1998, Hussmann (US) supermarket showcases approached Unity to be their local distributor. In line with this; Unity was required to open a separate service and installation company to take care of Hussmann equipment installation, service, repair, and maintenance. Thus was born UMC A/C & Refrigeration Contractors, Inc.
Around 2000-2001 Scotsman ice machine at that time was also looking for a distributor. 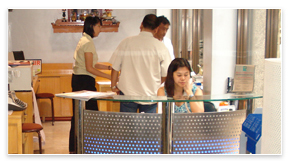 On year 2001; we were given official distributorship of Scotsman ice machines for Philippine territory. In 2000-2001, Unity together with its sister company UNI-FAB Metal Industries, Inc. started locally manufacturing stainless steel chillers and freezers for the local restaurant and fastfood industry. In 2005, Unity together with UNI-FAB also started the local manufacturing of polyurethane insulated panels for small cold rooms. This year, Unity will be having its newest sister company to be based in Davao. This company was established to provide for the sales, service, repair and preventive maintenance of Unity and UNI-FAB supplied air-conditioning and refrigeration parts, supplies and equipments in the Mindanao region. We have also merged Speedy Engineering Services with Unity Marketing Corporation recently to provide for bigger and better services for our clients. Speedy will now be the Service Department of Unity Marketing Corporation. Our service department specializes in mechanical works installation, repair, service and preventive maintenance including (but not limited to) air-conditioning, ventilation and refrigeration system requirements.